Almond Joy Candy (Slow cooker or Stovetop) – an easy 4 ingredient homemade version of the popular candy bars. Best of all, this recipe is loaded with almonds, coconut, chocolate and Almond Bark. Plus recipe video. What’s your favorite candy bar? My husband has many favorites but one day he was telling me that it’s been too long since he’s had an Almond Joy. There’s just something about the chocolate, coconut and almond combo that is hard to resist. So I’ve been testing out batches of my own homemade version – and you guys know I’m crazy about my crock-pot recipes, so I tossed all the ingredients into my slow cooker! Coat your slow cooker with coconut oil or non-stick cooking spray. This prevents chocolate from sticking and easily scorching. 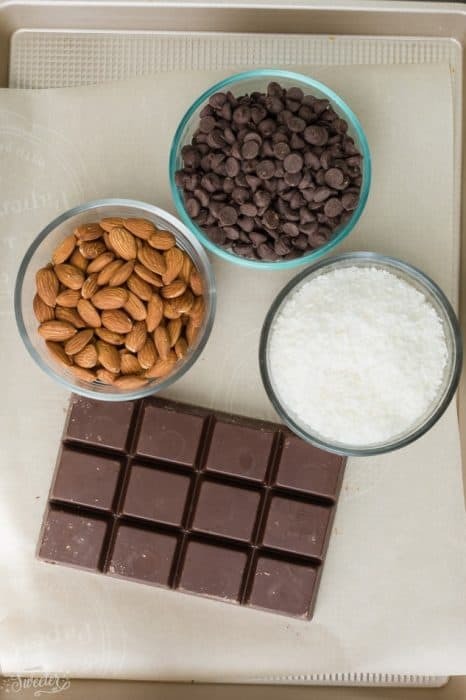 This is the almond bark I use – Almond bark is usually located in the baking aisle with the rest of the baking chocolate at your grocery store. Almond bark is essential to help the candy not seize or burn – I have not tested this with any other chocolate. **Every single slow cooker heats at a different level so make sure you watch the chocolate and do not overcook. Add the chopped almond bark AFTER the first batch of chocolate has melted. This prevents burning and the chocolate from seizing. It’s important to keep stirring until completely melted. Once the mixture has melted, add the coconut and almonds. If you don’t have a slow cooker or would rather use the stovetop, place a double boiler over the stove. Then heat the chocolate and almond bark together until melted. Finally, you’re going to stir in the almonds and coconut. Use a small cookie scoop (packed tightly) or drop mixture by the spoonful (about 1 1/2 tablespoons) onto a parchment lined baking sheet. 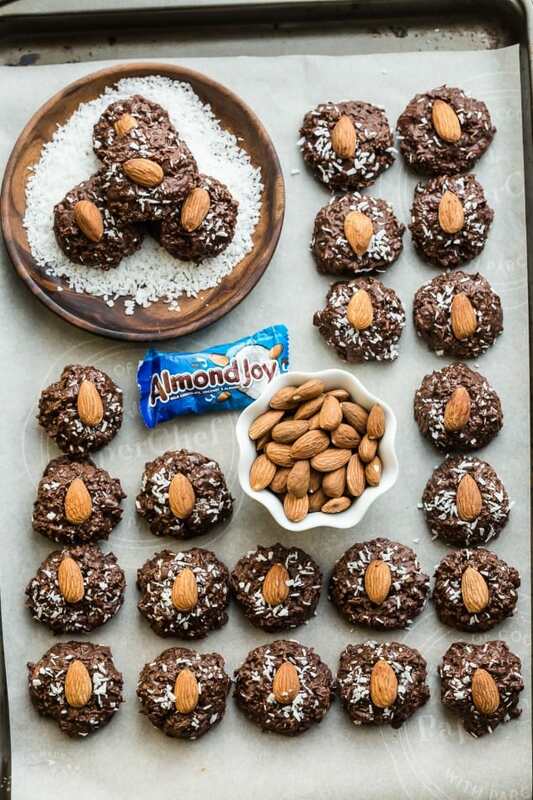 To make these extra pretty, top them with a whole almond in the center. Then sprinkle with more shredded coconut. They make the perfect gift for friends or family around the holidays or anytime you need an easy sweet treat! Slow cooker Almond Joy candy - A super easy 4 ingredient homemade version of the popular candy bar. 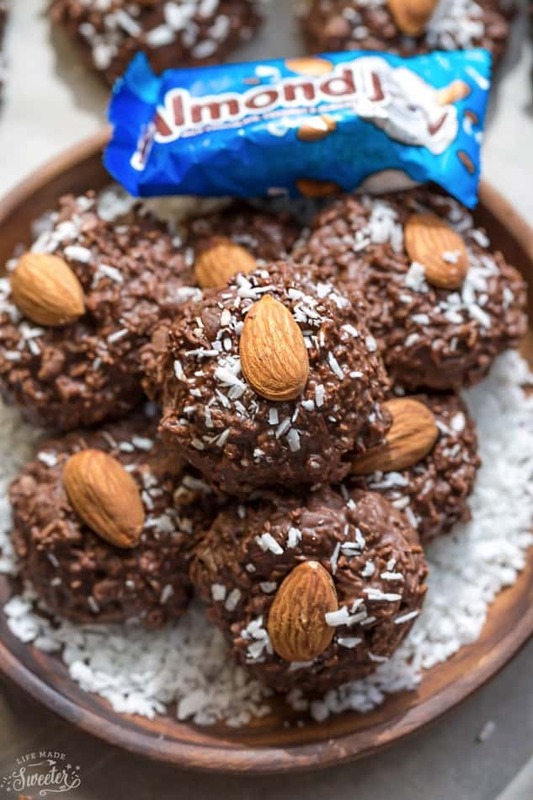 Best of all, this recipe is made entirely in the Crockpot with crunchy almonds, chewy coconut, chocolate, and almond bark. Add almond bark followed by semi-sweet chocolate chips to slow cooker. Cover the top of the slow cooker with a kitchen towel or paper towels before adding the lid. This will catch condensation that can drip onto the chocolate when you lift the lid to stir which can cause the chocolate to seize. Set the temperature on low and cook for 1 - 1-1/2 hours (check at 45-minute point - depending on how hot your slow cooker cooks) and stir every 20-30 minutes until completely melted. Add German chocolate and stir until completely melted (this tempers the chocolate to prevent seizing). Stir in the almonds followed by a layer of shredded coconut. Turn the slow cooker off and allow to sit for 5 minutes. Line a large cookie sheet with parchment paper and drop spoonfuls using a small cookie scoop (compacted tight)(SEE NOTE) or about 2 Tablespoons onto the cookie sheet. (Add more coconut or chopped almonds if your mixture is too runny and does not hold together). You can also fill them into lined mini muffin tins if you prefer. Press one whole almond in the middle and sprinkle with shredded coconut, if desired. Allow the candy to cool completely - it will harden as it cools. In a large double boiler, add chocolate and almond bark and heat until melted. Turn off heat and stir in coconut then almonds. Remove from heat and allow to stand for 2 minutes. 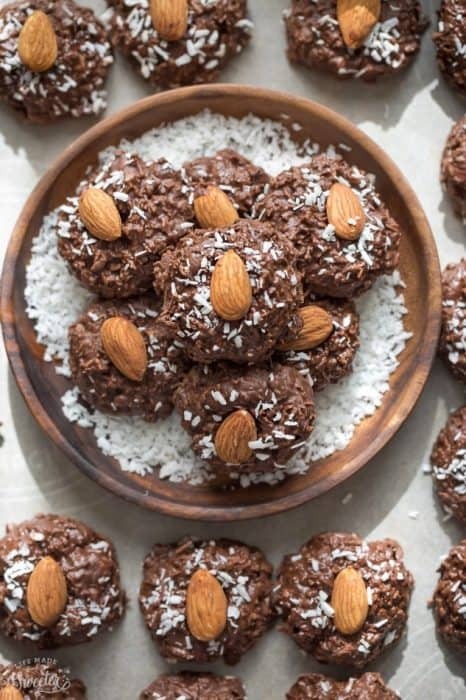 Line a large cookie sheet with parchment paper and drop spoonfuls using a small cookie scoop (compacted tight)(Add more coconut or chopped almonds if your mixture is too runny and does not hold together) or about 2 tablespoons onto the cookie sheet. **if the candy seems too soft and does not hold together, add a little bit more coconut, 1 tablespoon at a time until the candy compacts. Just remember that they will harden as they cool so they will stick later on. Also if your slow cooker runs hot, you will have to check on the mixture at 45 minutes just in case. I use a Hamilton Beach 5 Quart and mine took just a little over 1 1/2 hours to melt. Almond Joys were my favorite when I was younger too! So creative that you made them in the slow cooker! I would have a hard time just eating one! These look so wonderful! I love that you made them in your slow cooker! Kelly, this is SUCH great idea! I would’ve never thought to make this in the slow cooker. My husband loves almond joy, so I will have to surprise him with these babies. Such a fun way to make (and eat) candy! OH MY WORD. These are definitely happening this year! SO perfect for Christmas gift giving, and gluten-free which is important in our family these days! Definitely saving this one. 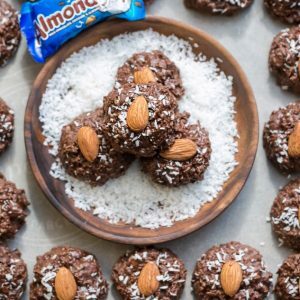 OMG, Almond Joy were one of my favorite candies before I developed an allergy to cocoa! I seriously get so sad whenever I see them in the store and I know I can’t eat them. So clearly this post is torture to my soul! 😉 LOL!! These look FABULOUS, Kelly!! I can’t get over how easy these chocolaty babies are to whip together! Seriously, homemade candy winning going on here! I’m going to have to make these for Boy and watch in jealousy as he devours them all! Cheers, sweets! That’s very creative, Kelly. 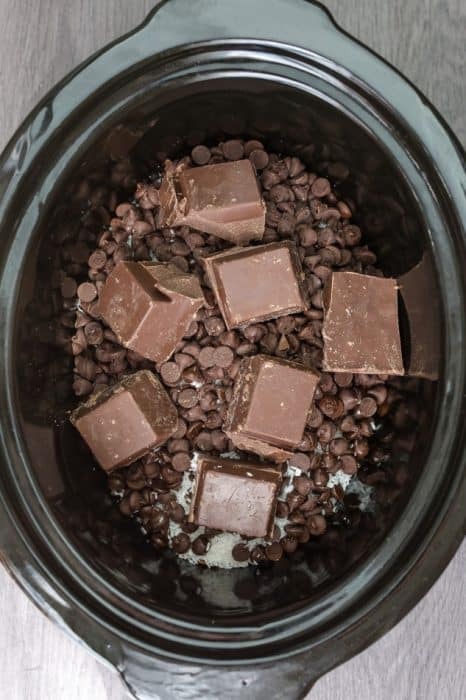 Would have never thought of using slow cooker to make candies. They look great. Candy in the slow cooker??? What??? That’s so fun! I have always loved almond joys and even better homemade!! 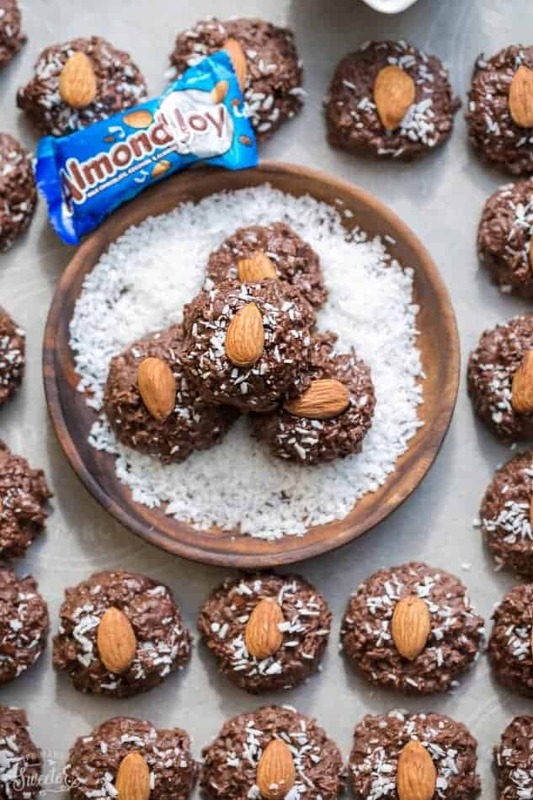 Love Almond Joy and these are so easy to make! Great video! Pinned! Kelly, this is amazing! I can’t believe you made Almond Joy in your slow cooker! Pinned! Love love love!! Almond Joys are one of my favorites. I love the chocolate + coconut combo, so I’ll gladly take a Mounds if it’s available, too. Making these in the crock pot is genius! Wow! I have never heard of slow cooker candies. 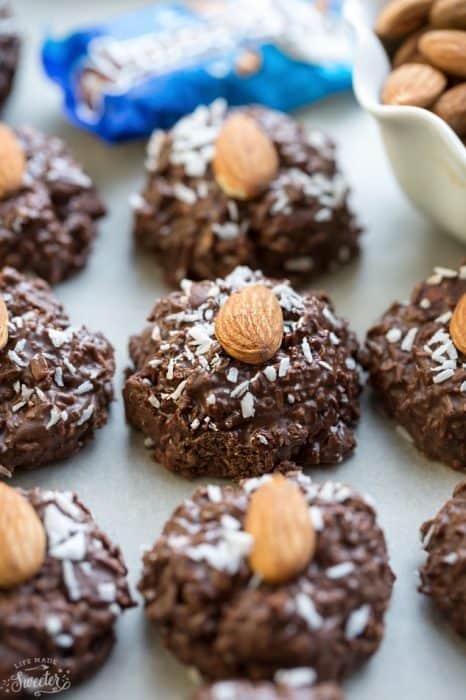 These slow cooker almond joy candies look so pretty and so delicious. Also love how easy they are. Homemade almond joy?!? This looks so dangerous and delicious! What a great way to use the slow cooker! These candies are perfect for the upcoming holidays! wow, you can literally make everything in your slow cooker Kelly! they look delicious! yum! How long in advance can I make these? How long will they keep? Hi Jennifer, They can last up to 3 months in the freezer or about 2 weeks at room temperature. What exactly is the almond bark? And what could I substitute for it? Hi there, Almond Bark is a special type of chocolate candy for melting. You could try substituting it with chocolate melts or candy melts but I’ve never tried so I’d love to hear if it does work. Do the whole almonds you put in the crockpot break apart? Oh no! I’m so sorry to hear that, Bonnie! I make these all the time and they have never clumped. It could be your slow cooker runs hot – what brand is it. I know Crock-Pots run very hot even on low or the brand of of chocolate or chocolate chips you bought. Keep adding oil or shortening until it liquefies again on on very very low heat. Hopefully it helps – good luck!